Abstract. Streams are important sources of carbon to the atmosphere, though knowing whether they merely outgas terrestrially derived carbon dioxide or mineralize terrestrial inputs of dissolved organic matter (DOM) is still a big challenge in ecology. 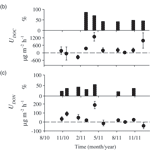 The objective of this study was to investigate the influence of riparian groundwater (GW) and in-stream processes on the temporal pattern of stream DOM concentrations and quality in a forested headwater stream, and whether this influence differed between the leaf litter fall (LLF) period and the remaining part of the year (non-LLF). The spectroscopic indexes (fluorescence index, biological index, humification index, and parallel factor analysis components) indicated that DOM had an eminently protein-like character and was most likely originated from microbial sources and recent biological activity in both stream water and riparian GW. 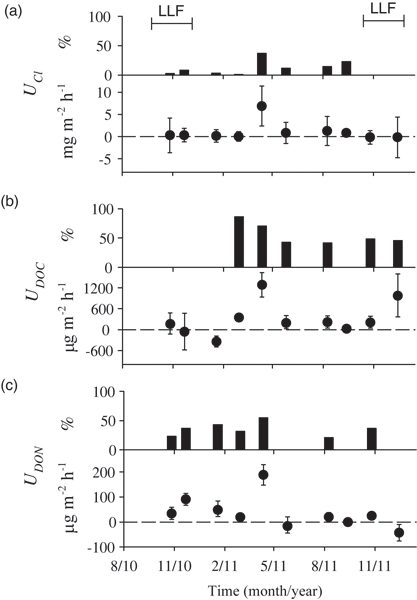 However, paired samples of stream water and riparian GW showed that dissolved organic carbon (DOC) and nitrogen (DON) concentrations as well as the spectroscopic character of DOM differed between the two compartments throughout the year. A simple mass balance approach indicated that in-stream processes along the reach contributed to reducing DOC and DON fluxes by 50 and 30%, respectively. Further, in-stream DOC and DON uptakes were unrelated to each other, suggesting that these two compounds underwent different biogeochemical pathways. During the LLF period, stream DOC and DOC:DON ratios were higher than during the non-LLF period, and spectroscopic indexes suggested a major influence of terrestrial vegetation on stream DOM. Our study highlights that stream DOM is not merely a reflection of riparian GW entering the stream and that headwater streams have the capacity to internally produce, transform, and consume DOM. How to cite: Bernal, S., Lupon, A., Catalán, N., Castelar, S., and Martí, E.: Decoupling of dissolved organic matter patterns between stream and riparian groundwater in a headwater forested catchment, Hydrol. Earth Syst. Sci., 22, 1897-1910, https://doi.org/10.5194/hess-22-1897-2018, 2018.